Great historical fiction, the fourth in Phil Ward's "Raiding Forces" series, written by a combat-hardened veteran. Lord Louis Mountbatten accepted the Japanese surrender in 1945, was the last Viceroy of India, and was murdered by the IRA. Germany: A sterilization program for the "undesired" populations begins. Austria: Chancellor Engelbert Dollfuss is murdered by the Nazis. Spain: Day 9 of 985 of the Spanish Civil War. The Comintern, the international communist organization initiated in Russia, agrees to send volunteers and funds to aid the Spanish Republic. Spain: Day 374 of 985 of the Spanish Civil War. CBI - China: Day 19 of 2,987 of the 2nd Sino-Japanese War. Day 19 of 33 of the 2nd Battle of Hebei. Day 12 of 22 of the Battle of Tainjin-Beijing. Japanese troops clash with Chinese troops at the city of Langfang, a major rail junction between Beiping and Tianjin. Germany: Jewish doctors are prohibited by law from practicing medicine. Spain: Day 739 of 985 of the Spanish Civil War. CBI - China: Day 384 of 2,987 of the 2nd Sino-Japanese War. Day 45 of 139 of the Battle of Wuhan. Poland: Five weeks before the outbreak of war, the Polish Cipher Bureau turns over the Enigma machines they had stolen from the Germans (along with all their decoding techniques) to French and British military intelligence. CBI - China: Day 749 of 2,987 of the 2nd Sino-Japanese War. Day 42 of 68 of the Battle of Tianjin. CBI - Mongolia: Day 76 of 129 of the Battle of Khalkhin Gol, a border dispute between the Soviet Union and Japan. USA: The United States bans the sale of scrap metal and petroleum to Japan. USA: The USS TRENTON arrives at Annapolis, Maryland, with the royal family of the Duchy of Luxembourg. ETO - UK: Day 16 of 114 of the Battle of Britain. The Luftwaffe attacks shipping and naval bases at Dover, Portsmouth, Poole and Portland. Germany: The German Reich Minster of Economics outlines the New Order for Europe, which includes using forced labor from the occupied countries. ETO - Switzerland: General Henri Guisan, commander of the Swiss military, vows that Switzerland will defend against any German or Italian invasion. MTO: The United Kingdom begins evacuating women and children from Gibraltar. MTO - Egypt: Italy bombs the British naval base at Alexandria and the base at Haifa. East Africa: Day 46 of 537 of Italy's East African campaign in the lands south of Egypt. CBI - China: Day 1,115 of 2,987 of the 2nd Sino-Japanese War. Day 254 of 381 of the Battle of South Guangxi. South America: Day 21 of 27 of the Ecuadorian-Peruvian War, a territorial dispute between Peru and Ecuador. ETO - Germany: The RAF bombs at Kiel for the second day, this time hitting the Deutsche Werke shipyard facilities. Russian Front - Finland: Day 27 of 142 of Operation SILVER FOX, a joint German-Finnish campaign to capture the Russian port of Murmansk in the Arctic. Russian Front - Finland: Day 25 of 140 of Operation ARCTIC FOX, a joint German-Finnish campaign against Soviet Northern Front defenses at Salla, Finland. Russian Front - Finland: Day 34 of 164 of the Battle of Hanko. Russian Front - Finland: Day 16 of 18 of Finland's reconquest of Ladoga, Karelia. The Finns continue their offensive on Lake Ladoga northeast of Leningrad. Russian Front: Day 34 of 167 of Germany's Operation BARBAROSSA, the invasion of the USSR. Russian Front - North: In Kovno, 3,800 Jews are killed during a pogrom by local Lithuanians. Russian Front - Center: Day 20 of 31 of the 1st Battle of Smolensk, Russia. Russian Front - Center: Day 2 of 38 of the Battle of Gomel, Belarus. Russian Front - South: Day 11 of 25 of the Battle of Uman, Ukraine. MTO - Libya: Day 107 of 256 of the Siege of Tobruk. East Africa: Day 411 of 537 of Italy's East African campaign in the lands south of Egypt. CBI - China: Day 1,480 of 2,987 of the 2nd Sino-Japanese War. Russian Front - North: Day 321 of 872 of the Siege of Leningrad. Russian Front - North: Day 82 of 658 of the Siege of the Kholm Pocket. Russian Front - South: Day 28 of 150 of Germany's CASE BLUE, the failed offensive to take the Caucasus oil fields. Elements of German Army Group South heading toward Stalingrad are stopped by the Soviets forcing them to have to wait for the 4th Panzer to come back up. Russian Front - South: Day 3 of 20 of Germany's Operation EDELWEISS. German 4th Panzer of Army Group B hooks up with German Army Group A and shatters the Soviet defenses. MTO - Egypt: Day 25 of 27 of the 1st Battle of El Alamein. 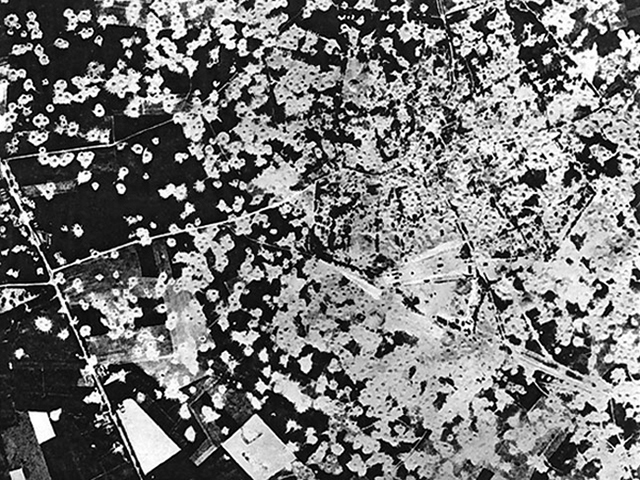 MTO - Libya: US B-17s and B-24s bomb Tobruk. East Africa: Day 82 of 186 of the Battle of Madagascar. CBI - China: Day 1,845 of 2,987 of the 2nd Sino-Japanese War. Day 72 of 124 of Japan's Zhejiang-Jiangxi Campaign, launched to punish anyone suspected of aiding the Doolittle raiders in China. Roughly 250,000 Chinese will be killed. PTO - Alaska: Day 49 of 435 of the Battle of Kiska, Aleutian Islands. PTO - Malaya: Day 157 of 357 of the Battle of Timor Island. PTO - New Guinea: Day 5 of 119 of the Battle of the Kokoda Track. 5th Air Force provides air support. Japanese troops push to Oivi, within 6 miles of Kokoda. ETO - Germany: During the morning, German radio says that Hamburg is still burning and 100,000 are homeless. This is before the US 8th Air Force bombs the city again in the afternoon. Russian Front - North: Day 686 of 872 of the Siege of Leningrad. Russian Front - North: Day 447 of 658 of the Siege of the Kholm Pocket. Russian Front - Center: Day 21 of 50 of the Battle of Kursk, Russia. Russian Front - Center: Day 14 of 38 of the Battle of Orel, Russia. Russian Front - South: Day 3 of 23 of the Battle of Belgorod, Russia. Russian Front - South: Day 13 of 48 of the USSR's Lvov-Sandomierz Offensive. MTO - Italy: Benito Mussolini is arrested and his Italian Fascist government falls. Italy's King Victor Emanuel asks General Pietro Badoglio, Mussolini's former chief of staff, to take over as Prime Minister. Badoglio begins negotiating a conditional surrender with the Allies. Hitler orders his German troops to disarm their former allies and take control of Italy. MTO - Italy: Day 17 of 40 of the Battle of Sicily. RAF and US Air Forces provide air support. Allied troops run into stiff resistance as they approach Messina. CBI - China: Day 2,210 of 2,987 of the 2nd Sino-Japanese War. US 14th Air Force bombs the Hankow Airfield. PTO - Alaska: Day 414 of 435 of the Battle of Kiska, Aleutian Islands. US 11th Air Force P-40s, some flown by Canadian pilots, attack Kiska Island and Little Kiska Island. PTO - Dutch East Indies: The USS POMPON sinks the Japanese cargo ship THAMES MARU. PTO - New Guinea: Day 95 of 148 of the 2nd Battle of Lae-Salamaua. US 5th and 13th Air Forces provide air support. PTO - Solomon Islands: Day 36 of 67 of the Battle of New Georgia. US 5th and 13th Air Forces provide air support. The US launches what will become their final offensive against Japanese positions. ETO - France: Day 1 of 29 of the Breakout Battle of Normandy. Day 1 of 7 of Operation COBRA. This major offensive is designed for the Allies to breakout of the hedgerow country, beginning with a massive bombing near St Lo to create a hole in the line. A slow moving wind, however, shifts the smoke below over Allied lines which the hour-long stream of bombers target, killing 111, including US Lt Gen Lesley McNair. 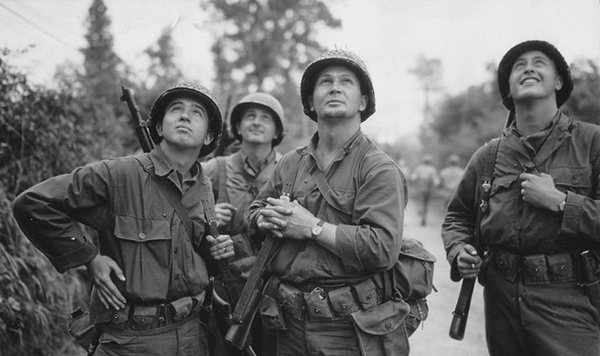 Following the successful Allied invasion of Normandy on 6 June 1944, progress inland was slow. It was time to change that, starting with a massive ariel bombardment of German positions that would allow for a strong punch through their lines. First, some 600 Allied fighter-bombers attacked strongpoints and enemy artillery in the St Lo area. 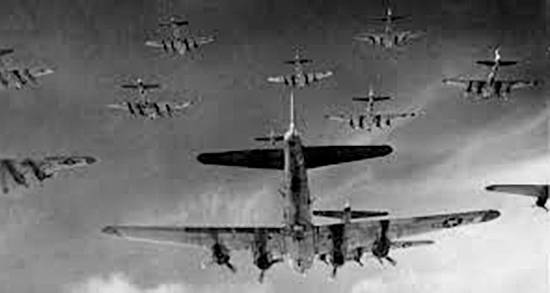 Then, for an entire hour 1,800 heavy bombers of the US 8th Air Force saturated a 6,000 yd x 2,200 yd area on the road between St Lo and Periers, followed by a third wave of medium bombers. Approximately 3,000 US aircraft carpet-bombed the narrow section of the front. And then a new sound droned into our ears, a sound deep and all encompassing - with no notes in it, just a gigantic faraway surge of doomlike sound - It was the heavies. They came from directly behind us, at first they were the merest dots in the sky. We could see clots of them against the far heavens, too tiny to count individually. They came on with a terrible slowness. They came in flights of twelve, three flights to a group, and in groups stretched out across the sky. They came in families of 70 planes each. Maybe those gigantic waves were two miles apart, maybe they were ten, I don't know. But I do know they came in a constant procession and I thought it would never end. What the Germans must have thought is beyond comprehension. The flight across the sky was slow and studied. I've never known a storm, or a machine, or any resolve of man that had about it the aura of such ghastly relentlessness. I had the feeling that even if God had appeared to beseech before them in the sky, with palms outstretched to persuade them back, they would not have had within them the power to turn from their irresistible course. The stream of 1,800 heavy bombers over the German positions was massive beyond anything previously sent up before, taking an entire hour from the first to the last plane to pass overhead. Ground units had marked the target area with mortar fire which the 8th Air Force began to accurately hit with anti-personnel bombs. But a moderate breeze began to shift the huge area of smoke and dust below toward Allied lines, which the massive armada above continued to accurately target. Frantic radio traffic from below and from low flying fighter planes tried desperately to warn of the danger of imminent friendly fire, but the command structure just wasn't quick enough to issue corrections before disaster struck, and 111 Allied troops were killed on the ground, another 490 wounded. 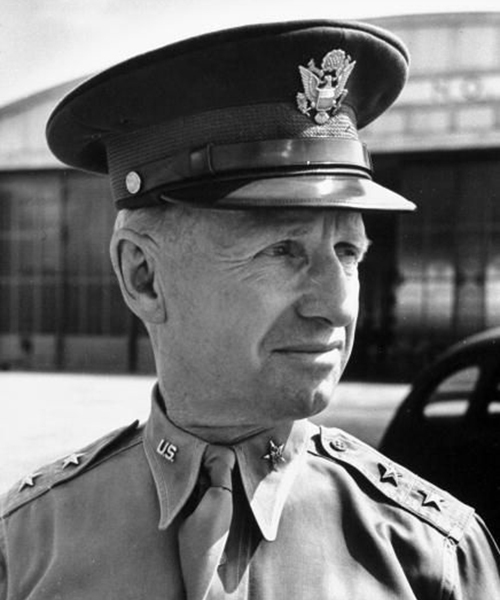 The dead on the ground included Lieutenant General Lesley J McNair - the highest-ranking US soldier to be killed in action in the European Theater of Operations. For decades, many of the bomber crews involved were guilt-ridden, needlessly blaming themselves for inaccurate targeting. ETO - UK: Day 43 of 86 of the V-1 "Buzz Bomb" offensive on Britain. ETO - France: Day 50 of 62 of the Battle of Caen. Canadian troops attack south of Caen. ETO - France: US 8th and 9th Air Forces make a maximum effort for Operation COBRA, sending all planes to bomb the area near St Lo. Some of the bombs fall short, killing 102 US troops and wounding 380 more. ETO - Germany: After five days evading the Germans, America's top scoring fighter Ace Francis "Gabby" Gabreski is finally captured and sent to Stalag Luft I. His record of 28 credited kills in the ETO will not be broken. Germany: German authorities complete the evacuation of Jewish ghettos in Kovno, Lithuania. Russian Front - Finland: Day 35 of 50 of the Battle of Karelia. Soviet troops continue their offensive against the Finns in eastern Karelia between Lake Ladoga and Lake Onega in northern Russia. Russian Front - North: Day 175 of 191 of the Battle of the Narva Isthmus, Estonia. The Germans begin evacuating Narva withdrawing to the Tannenberg position to the west. Day 1 of 19 of the Battle of Tannenberg Line, Estonia. The Soviets mount an offense at Sinimaed Hills, but it fails due to stiff resistance. Russian Front - Center: Day 21 of 27 of the Battle of Siauliai, Lithuania. The Soviets cut the road between Dvinsk and Riga in Latvia. Russian Front - Center: Day 21 of 23 of the Battle of Belostock, Poland. Russian Front - Center: Day 13 of 15 of the Battle of Lvov, Poland. Lvov is now surrounded by the Soviets. Russian Front - Center: Day 13 of 15 of the Battle of Stanislav, Poland. Russian Front - Center: Day 8 of 16 of the Battle of Lublin, Poland. The Soviets reach the Vistula River, 40 miles west of Lublin. MTO: US 15th Air Force bomb targets in Austria and Yugoslavia. CBI - Burma: Day 143 of 166 of the UK's Operation THURSDAY. US 10th Air Force provides air support. CBI - Burma: Day 138 of 147 of the Battle of Myitkyina. US 10th Air Force provides air support. CBI - Burma: Day 116 of 302 of the Chinese Salween Offensive. US 14th Air Force provides air support. CBI - China: Day 2,576 of 2,987 of the 2nd Sino-Japanese War. Day 100 of 259 of Japan's Operation ICHI-GO. Day 34 of 48 of the Battle of Hengyang. US 14th Air Force provides air support. CBI - Indonesia: The British Eastern Fleet bombards Japanese airfields and the port at Sabang on Sumatra. PTO - Caroline Islands: US 7th Air Force bomb targets in the Truk Atoll. PTO - Dutch New Guinea: Day 24 of 61 of the Battle of Noemfoor. Although the island has been declared secured, bitter fighting from Japanese continues. PTO - Mariana Islands: Day 2 of 9 of the Battle of Tinian. US 7th Air Force provides air support. About 3,000 Japanese soldiers are killed in a Banzai charge. PTO - Mariana Islands: Day 5 of 21 of the 2nd Battle of Guam. US 7th Air Force provides air support. PTO - New Guinea: Day 60 of 83 of the Battle of Biak. There are still 3,000 Japanese soldiers on the island who won't give up. PTO - New Guinea: Day 224 of 597 of the Battle of New Britain. US 13th Air Force provides air support. PTO - New Guinea: Day 95 of 481 of the Battle of Western New Guinea. 5th Air Force provides air support. PTO - New Guinea: Day 42 of 80 of the Battle of Lone Tree Hill. PTO - New Guinea: Day 16 of 47 of the Battle of Driniumor River, a failed Japanese offense on US troops near Aitape. PTO - Palau Islands: The USS FRANKLIN begins a three-day air strike against Palau Islands, Yap Island and Ulithi Atoll. Future president George H W Bush gets a share of the credit for sinking of a Japanese cargo ship. PTO - Solomon Islands: Day 268 of 295 of the Battle of the Bougainville Islands. US 13th Air Force provides air support. Germany: A proclamation to the Japanese people is issued by the UK, US and China from Potsdam, which warns of devastation to come and calls for Japan's unconditional surrender. CBI: US 14th Air Force attacks targets in China and French Indochina. CBI - China: Day 2,941 of 2,987 of the 2nd Sino-Japanese War. PTO - Borneo: Day 46 of 67 of the Battle of North Borneo. US 5th and 13th Air Forces provide air support. PTO - Japan: US carrier planes attack Japanese shipping in the Inland Sea near Osaka and Nagoya. PTO - Japan: US 20th Air Force B-29s bomb the Mitsubishi Oil Company and Hayama Petroleum Company at Kawasaki. PTO - New Guinea: Day 576 of 597 of the Battle of New Britain. US 10th Air Force provides air support. PTO - New Guinea: Day 460 of 481 of the Battle of Western New Guinea. US 10th Air Force provides air support. PTO - Philippines: Day 278 of 299 of the 2nd Battle of the Philippines, aka the Liberation of the Philippines or the Philippines Campaign. PTO - Philippines: Day 223 of 244 of the Battle of Luzon. The battle is said to over but hold-outs will continue fighting until the end of the war. PTO - Philippines: Day 138 of 159 of the Battle of Mindanao Island. The battle is said to over but hold-outs will continue fighting until the end of the war. PTO - Philippines: Day 130 of 135 of the Battle of the Visayas region. The battle is said to over but hold-outs will continue fighting for several weeks. 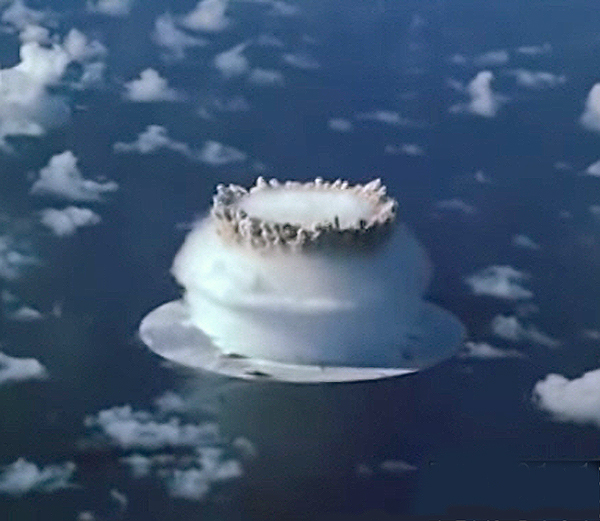 Micronesia: The United States conducts test BAKER in the Bikini Atoll as part of Operation CROSSROADS, which sees an atomic detonation under the sea (test ABLE on July 1st was in the air). 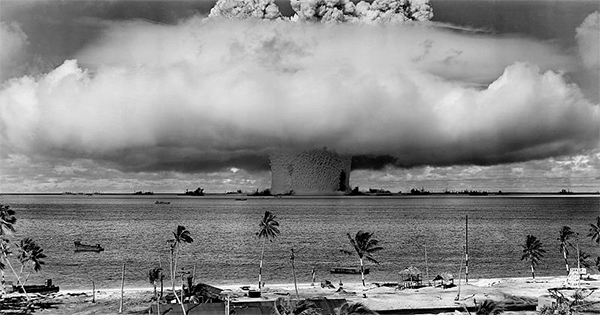 The "Baker" explosion, part of Operation CROSSROADS, a nuclear weapon test by the United States military at Bikini Atoll, Micronesia, on 25 July 1946. The wider, exterior cloud is actually just a condensation cloud caused by the "Wilson" chamber effect and was very brief. There was no classic mushroom cloud rising to the stratosphere, but inside the condensation cloud the top of the water geyser formed a mushroom-like head called the cauliflower, which fell back into the lagoon. The water released by the explosion was highly radioactive and contaminated many of the ships that were set up near it. Some were otherwise undamaged and sent to Hunter's Point in San Francisco, for decontamination. Those which could not be decontaminated were sunk a number of miles off the coast of San Francisco. News of the Operation CROSSROADS tests inspired a new term in the fashion industry for two-piece swimwear for women: the bikini, which debuted in Paris on 05 Jul 46 with expectations of a similarly explosive public reaction. Anyone too young to remember WWII may find it hard to imagine just how devastated Sheffield was by two German raids in December 1940.